Prasinohaema prehensicauda with green blood due to high concentrations of biliverdin accumulation, note green color of the mucosal lining and tongue. Photo by Chris Austin. Purple, Gold and... Green? These Lizards Have Crazy Levels of Toxic Green Bile Pigments in their Blood. You’ve probably seen red blood before. You may have even seen blue or purple blood. But have you ever seen green blood?? Researchers at LSU recently discovered a group of lizards in New Guinea that have lime-green blood. Prasinohaema are green-blooded skinks, a type of lizard, that somehow thrive with what would be toxic human levels of biliverdin, a green bile pigment. We humans do have some biliverdin in our blood, but these lizards have levels of biliverdin 40 times higher than those in humans. Zachary Rodriguez, a doctoral candidate in the LSU Department of Biological Sciences, and his major professor Chris Austin, professor of biological sciences and head curator of amphibians and reptiles at the LSU Museum of Natural Science, have been leading research on these unusual lizards and how their green blood may offer cues for treatment of infectious diseases such as malaria in humans. We asked Zach and Chris to tell us more about their research and these unusual lizards. LSU College of Science: Can you tell us more about the green-blooded skinks you’ve found in New Guinea? Zach: Prasinohaema is a genus of arboreal lizard endemic to New Guinea and surrounding archipelagos. The five described species of Prasinohaema are morphologically and ecologically diverse and occupy a variety of habitats. Some species live at high elevation montane habitats in primary and secondary forests up to 3000 meters, while others live in low elevation coastal forests. There is color pattern variation between and among species, with some species experiencing sexual dimorphism. Prasinohaema lizards also exhibit some extraordinary morphological and physiological modifications rare in the animal kingdom, including adhesive toe pads, live birth and prehensile tails! But one extraordinary physiological change has occurred in all five (and a few un-described) species: green blood! Prasinohaema virens, another green blooded lizard from the lowlands of Papua New Guinea. This is the only species that lays eggs, all other green blooded species give birth to live young. This individual is an adult male characterized by the blue side patch coloration. Photo by Chris Austin. LSU College of Science: How did you make the discovery of green blood in New Guinea lizards? Zach: The green blood in these lizards was first described by Allen Greer in 1969, but little research has been done since then. Dr. Christopher Austin became enamored with these lizards during his Ph.D. at the University of Texas in Austin. He set out to investigate why they have green blood. One of his first projects confirmed that biliverdin is the biochemical responsible for the green coloration. Dr. Austin has spearheaded many expeditions to the megadiverse island of New Guinea to discover and document reptile and amphibian diversity. He’s accumulated ample high-quality tissue samples for four of the five described species of Prasinohaema during his trips, including one new species with green blood! Chris: I have been conducting fieldwork on amphibians and reptiles in Papua New Guinea for the last 27 years. We have fieldwork planned for next year and Zach will be joining the expedition then! Field accommodations in Kaironk Village in the highlands of Madang Province (6,000 foot elevation). With assistance from local peoples and the Papua New Guinea National Museum, fieldwork in this area of Papua New Guinea has provided valuable tissue samples and voucher specimens for this research. Photo by Chris Austin. LSU College of Science: Why is Prasinohaema’s green blood so scientifically fascinating (other than looking cool!)? Zach: While most vertebrates have red blood, the scincid lizard genus Prasinohaema is diagnosed by lime-green colored blood, resulting in green coloration of their muscles, bones, tongue and mucosal tissues. The green coloration of the blood is due to high levels of the green bile pigment biliverdin. This pigment eclipses the crimson color of red blood cells in Prasinohaema blood. Green blood is absent in all other amniotes, which includes mammals, birds and reptiles. This is likely because green blood is a dangerous trait to have. Bile pigments (biliverdin and bilirubin) are genotoxic, cytotoxic and neurotoxic waste products that cause jaundice and damage various cellular components in other vertebrates. Due to their toxicity, bile pigments are usually rapidly removed from the body. Levels of biliverdin are generally not detectable in blood. But the concentration observed in these lizards is exceptionally high in comparison to other vertebrates. To illustrate, the highest recorded bile pigment concentration recorded in humans, which resulted in death, was only a tenth of the concentration in these lizards. Prasinohaema lizards have somehow evolved a resistance to the toxicity. Our group has been collaborating with Dr. Susan Perkins, curator and professor of microbial genomics at the American Museum of Natural History, to examine if biliverdin in these lizards deters infection by Plasmodium parasites, the causative agents of malaria. In this image, one tube (top) shows a blood sample from a regular red-blooded lizard from New Guinea (Lamprolepis smaragdina). The other tube (bottom) reveals the bright green blood of Prasinohaema. The bile in this blood could kill other species, but Prasinohaema handles it just fine. Credit: Chris Austin, LSU." LSU College of Science: Are these lizards poisonous to other animals? Chris: No, they are not. I have eaten them myself and they are not poisonous to humans, birds or snakes. LSU College of Science: Where does biliverdin come from? Chris: We humans are actually producing biliverdin every day! The green color you see in a bruise on your arm or leg is the green bile pigment biliverdin, and the yellow color of bruises is the yellow bile pigment bilirubin. Typically, red blood cells only last for about 120 days in humans. As red blood cells get old and break down, they produce the toxic bile pigments biliverdin and bilirubin. These toxic bile pigments are filtered out by our liver, which is like the oil filter of our circulatory system. In the vast majority of vertebrates, bile pigments are removed rapidly from the circulatory system via the liver. Even small concentrations of biliverdin or bilirubin in the circulatory system can cause pathological jaundice – except in these lizards. The green bile pigment in their blood overwhelms the intense crimson color of red blood cells, resulting in a striking lime-green coloration of their muscles, bones and mucosal tissues. LSU College of Science: What else have you discovered about the green-blooded lizards of New Guinea? What does research on green-blooded lizards look like? Zach: We have investigated the evolutionary history of green blood, which evolved in several species of New Guinea lizards. Our key discovery was that there are four separate lineages of green-blooded lizards and they all likely shared a red-blooded ancestor. We were excited by the complex history of these lizards and surprised by the breadth of green-blooded lineages across the phylogeny. Our most surprising finding is that lizards with biliverdin-rich blood don’t seem to be each other’s closest relatives. We had assumed at first that the evolution of bile pigment retention and tolerance was too complex to evolve more than once in lizards. But this hypothesis would require at least six independent reversals back to red blood. Our findings challenge the theoretical prediction that green blood evolved once in lizards, and reveals a complex evolutionary history of the transition between red and green blood. The independent emergence of an unusual trait in multiple species (or convergent evolution) suggests that green blood has an adaptive value. To ascertain if this unusual physiology is the result of convergent evolution, our next goal is to identify the genes responsible for green blood. Chris: My laboratory is currently looking into the genes responsible for the evolution of this unusual physiological trait. We think that understanding the genomic changes responsible for green blood will lead to a better understanding of jaundice and how to cure it. We take a small amount of liver, blood and muscle from these lizards to use for genetic analysis. We used modern next-generation sequencing to get thousands of genes from across the genome to resolve the evolutionary tree for this group of lizards. Prasinohaema semoni, a green blooded lizard from the lowlands of Papua New Guinea. Note this lizard is not green in outward coloration even though its blood, bones, and muscles are lime-green colored. Photo by Chris Austin. LSU College of Science: Do we know why these lizards have green blood and high levels of bile pigments? Zach: In New Guinea, there are no major ecological or biogeographic differences between lizards with green blood and closely related lizards with red blood. Prasinohaema occupy a diversity of habitat types ranging from lowland tropical forest to high elevation montane habitats, and both red- and green-blooded species have terrestrial and arboreal species, are broadly distributed, and are locally sympatric across much of the island. Why biliverdin-rich blood is selected for remains a mystery. Green blood has occurred in unrelated species of fish, insects and frogs, suggesting that green blood has beneficial properties. Biliverdin is deposited in the blood and scales of some insects and several fish, including the wooly sculpin (Clinocottus analis) and the Japanese eel (Anguilla japonica). Biliverdin has also been suggested to be the cause of green bones, skin and blood in several species of unrelated frogs including the elusive Samkos Bush Frog (Chiromantis samkosensis), Quang’s Tree Frog (Gracixalus quangi), and three species of glass frogs. The rare but taxonomically widespread occurrence of green blood suggest there are evolutionary advantages to keeping this toxic pigment in the body! Elevated levels of bile pigments have been shown to confer antioxidant properties and reduce pathogenic activity in vitro, though the function of these pigments in lizards is uncertain. The exciting future challenges are to identify the genes involved in green blood and to determine if bile pigment retention confers any major advantages in these lizards. Chris: It is plausible that small increases in biliverdin conferred some selective advantage and that over time even greater concentrations of biliverdin conferred an even greater advantage. However, the physiological and/or ecological importance of biliverdin accumulation is unknown. My laboratory is currently working to solve this puzzle. LSU College of Science: What excites you most about this research? Chris: Interestingly, research on lizards from half-way around the world has implications for human health. This goes to show why basic discovery science is so important. Jaundice is a common problem for newborns, affecting 60% of full-term babies and 80% of premature babies. In addition, babies treated for jaundice are more likely to develop autism. We think our research will lay the foundation for an integrative way to think about bile pigments and jaundice and in doing so contribute to biomedicine and potentially improve human health. Zach engages in science outreach at the LSU Museum of Natural Science. Photo credit: Zachary Rodriguez. LSU College of Science: Do you know of any other animals with strangely colored blood? Zach: Other blood colors are found in the animal kingdom, primarily due to the variety of oxygen-transport proteins that exist. For example, octopuses have blue blood. This comes from a copper-rich protein called hemocyanin, which serves a similar oxygen-transporting function as hemoglobin in mammals. Hemocyanin is more efficient at transporting oxygen in colder, low-oxygen environments than hemoglobin. 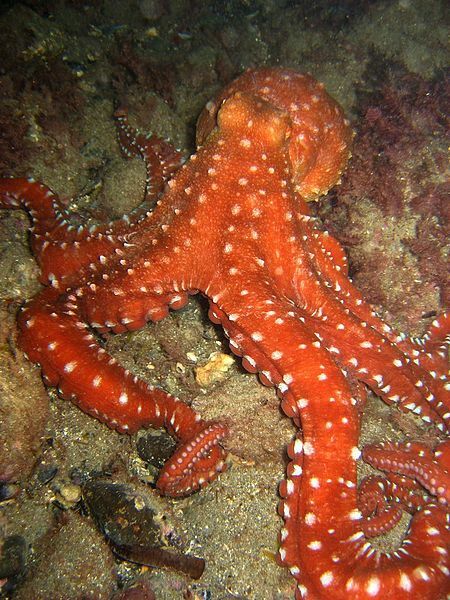 But it also makes the blood viscous, requiring three hearts to pump it to the cells of the octopus’ body! Purple blood can be found in many marine invertebrates due to the oxygen-transport protein hemerythrin, which turns bright purple when oxygenated. Sea squirts have yellow blood due to the aggregation of vanadium-collecting proteins called vanabins found in their blood. The biological significance of collecting vanadium remains a mystery. Octopuses, such as the Atlantic white-spotted octopus, have blue blood which comes from a copper-rich protein called hemocyanin, serving the same oxygen-transporting function as hemoglobin in humans. Credit: SUBnormali TeamYoruno. Many annelids (segmented worms) have green blood, but this is the result of the oxygen transport protein called chlorocruorin, which appears green in low concentrations. In contrast, the ocellated icefish (Chionodraco rastrospinosus) lacks any oxygen-binding hemeproteins, leaving its blood transparent or clear. There is enough dissolved oxygen in the cold depths of the Antarctic Ocean that the fish doesn’t need any protein to carry oxygen! Learn more about green-blooded lizards here! Interview responses collected by Alison Satake and Nicki Button.